A nice sized speaker with a lot of battery life, but can you use it outside as expected? Long battery life, great sound and nearly indestructible. Steep learning curve with deeply hidden controls. Whether you are looking for an indoor or outdoor Bluetooth speaker, this is a great option for a great price. 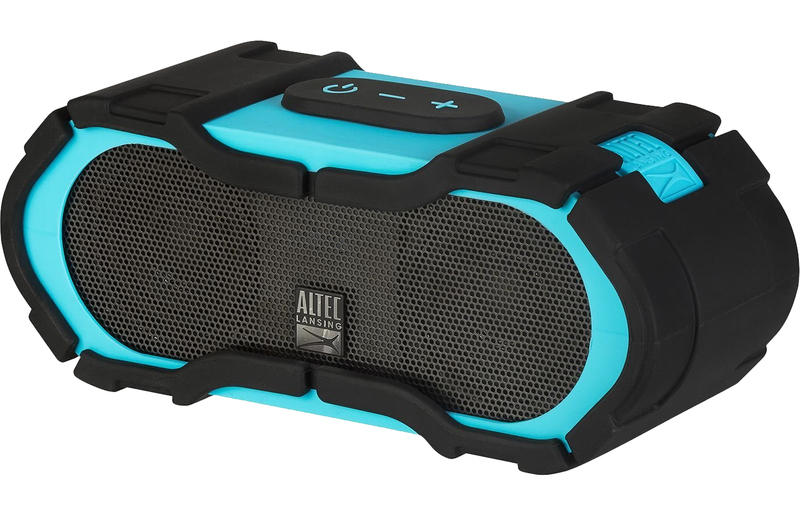 Altec Lansing is no stranger to quality audio products, and the BoomJacket does not disappoint. However, there are several categories that the company is trying to hit, and they have done a decent job of it. For example, while not trying to make an inexpensive speaker, they did try to make one that sounded good and was waterproof in a consumer-friendly price point (under $200). Some of this was accomplished via the lack of physical buttons (see Controls section), while others is accomplished via sound quality. While you're not going to get the quality sound you might get from some of our previous Bluetooth speakers that lack waterproofing, you will not be disappointed with the sound produced by the BoomJacket. Most impressibvely, this has not been accomplished at the cost of its durability. The sound quality and durability are more than worth it for the cost of the speaker, especially if you can get it on a discount, which puts it into the $175 range. This is a speaker that could easily be used outdoors by the pool or while camping, as its design would suggest, but you would be just as happy with it using it in your offic, bedroom or bathroom for music or television. This speaker supports one of my favorite pairing features on a Bluetooth device: NFC pairing. As long as you have a phone with even relatively modern technology, you can easily pair to the speaker with just the touch of the device. Unfortunately, not all phones released, even new phones, do not support this standard technology, so that means not all phones can pair this way. Luckily the manual process is almost as easy as the automated process. The phone detected the speaker and connected quickly through the manual process as this low-cost phone does not support NFC. It played music from Groove until the battery on the speaker died completely at which time the music paused automatically. The phone was able to connect to the speaker immediately via NFC and the speaker asked for permission to transfer contacts. The phone remained connected through an entire episode streamed on Netflix without any signal drops. The iPhone is one of the few high-cost phones to not support NFC pairing. Using the manual process, the phones was able to connect quickly and the speaker asked for permission to transfer contacts. The phone remained connected playing a full album through several music services without any signal drops. The tablet, running the most modern version of Windows, connected immediately via manual process. The tablet remained connected through several episodes streamed on Netflix without any signal drops. This phone took about 20 seconds to connect via NFC, between pairing and connecting, which was far longer than other devices. This appears to be Android-based and not a failing of the speaker itself. The range on this speaker is pretty good, but not quite what I might have hoped for considering its price point. The speaker does not claim any special range features, though, so it is not entirely unexpected. I was able to use the speaker almost everywqhere in my 3 bedroom apartment with the Lumia 928 in one corner, except the far corner, without any skipping or signal issues. Once I got outside, through exterior walls, the signal began to become a bit of a problem. This means that if you were to use this in or near the pool, it is likely that you will need to have your phone outside with you, but not exactly close. You could likely place it on a table away from the water and still have great reception without much issue. The BoomJacket has ridiculously long battery life. In this test, we used it for a full day in the office while breaking down the studio for CES. It was then used for a full day in the office during development work the next day. This speaker lasted through both of these long usages, while only ending up a little below half of the battery remaining. In fact, it took almost 3 full work days for the speaker to finally die. None of the devices we used with it lasted more or less than others, at least not in a way that was noticeable for this practical test. Running the battery test against this speaker, we got an average of 25 hours and 34 minutes of playtime across several tests. Unfortunately the company claims 40 hours of expected runtime, meaning that the speaker only lasted about 65% of the expected runtime. While any scenario that calls for a Bluetooth speaker to run for more than a full day straight without charging is ill-advised, it was a disappointment that the battery missed the expected by so much. This speaker is definitely designed for its waterproof music capabilities, but it does offer the ability to make and receive phone calls, though not easily discoverable. As such, we made a few phone calls and were pleasantly surprised at how well it worked. The quality of the phone is not the same as playing music, but it is not offensive by any measure. The speaker quality is far above that of most built-in speakerphones, making it a good deal for the owner. As for the person on the other end of the call, this sound quality is also above average, both for built-in speakerphones as well as other Bluetooth speakers. This would serve you well for a speakerphone, in addition to its usual purposes. Overall, using this speaker is very easy. There are only 3 buttons: power, volume up and volume down. Those buttons do exactly what you would expect: long-pressing the power button will turn the speaker on or off, and the volume buttons control the internal volume of the speaker, not the volume of the device. Unlike most speakers of this type, the BoomJacket does not have a Bluetooth button on it. Instead, the speaker always broadcasts its name for devices to find, meaning that if you leave it on while it is not playing, someone nearby might be able to pair to and play through the speaker. This could be especially annoying if you live in an apartment or condo. In addition to no pairing button, the speaker also does not have a phone/command button. Instead of a dedicated command button, you have to rapid-press the power button 2 or 3 times to activate the Bluetooth command. For example, if you want to summon Cortana on your phone, computer or tablet, you would have to double-tap the power button. Equally, the power button doubles as the phone answering button. When the phone is ringing through the speaker, pressing the power button will answer the call. The same button will also end the call if it is active. Another common control scheme for a Bluetooth speaker is the ability to play/pause the music directly from the speaker. With a waterproof speaker of this type, it is even more essential to have this capability. Imagine being in the pool with the speaker and needing to pause the music - the last thing you want to do is handle your phone. Once again, the power button doubles as the play/pause button. A short press will toggle the playing state while there is no active phone call. With a microphone comes the expectation for noise cancelation, even when the speaker does not focus on this particular feature. Luckily, the Altec Lansing has been thoughtful in regards to noise cancelation on the BoomJacket. While on a phone call, I tested typing on my computer with Cherry MX Blue mechanical switches about 6 inches from the speaker. The person on the other end of the call was mostly unaware of the noise while I was talking, but was able to hear them a little more while quiet. In addition, Cortana was not phased even a little while a television show was playing in the background, and was able to deliver my weather forecast without hesitation. Expanding on the Controls section, learning how to use this speaker is not easy or direct. The essential, obvious controls are right out front, but the other features are buried in multi-press and rapid-press commands. In addition to the commands mentioned before, there is also a multi-button command for disconnecting the active device (volume up and down together for 4 seconds) and battery status (power and volume up). There is very little chance that someone receiving this as a gift, for example, would be able to figure out how to access these features. In fact, it is more likely that someone would assume that those features are simply lacking, as did I. Even reading the manual will probably not teach you those controls. As I sit here writing, only maybe 2 minutes after writing what those controls are, I cannot come up with which one does which. That is neither a good sign for learnability, and not a good indicator that some of these features will ever be used. While I appreciate the inclusion of a battery status command, something many speakers lack, I do miss not being able to easily determine how many buttons I must press and for how long I must press them.